The Greater Peterborough Innovation Cluster (GPIC) recently hosted the first event in our Quarterly Breakfast Series for 2014: on Friday, February 14 at The Gathering Space in Gzowski College, Trent University. The Breakfast was held in association with our friends at the Greater Peterborough Chamber of Commerce. The Innovation Cluster’s Quarterly Breakfast series is presented by our founding Service Provider Partner – Bereskin & Parr, LLP, with the support of our sponsors: Stewart Group, Merit Precision Moulding, Peak Benefit Solutions, and Cambium, as well as our community partners: Community Futures Development Corporation and Workforce Development Board. 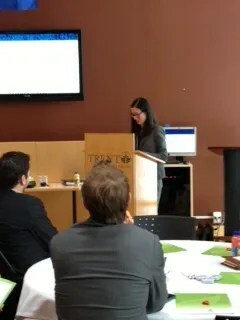 This “sold out” event featured a talk by Tamarah Luk, LL.B from Bereskin & Parr’s Regulatory, Adverstising and Marketing practice group, entitled: “More than just ‘spam’ – Canada’s new anti-spam laws and your business”: focusing on Canada’s anti-spam laws which come into effect on July 1, 2014. We were also thrilled to use this event to formally announce Bereskin & Parr LLP as the Cluster’s founding “Service Provider Partner”. To learn more about the Innovation Cluster’s partnership with Bereskin & Parr, click here! Also: follow us on Twitter: @InnovationPtbo; on Facebook: www.facebook.com/InnovationCluster; and via our Linkedin group: Greater Peterborough Innovation Cluster. The Greater Peterborough Innovation Cluster is a not-for-profit organization with a mission to strengthen Peterborough’s regional innovation capacity by bridging the gap between scientific research and business. The Cluster brings together talent, knowledge, and investment to drive technology-based economic development, innovation-driven economic growth and high-tech job creation across the Peterborough region by supporting entrepreneurship, innovation, commercialization and new company formation & growth. The Cluster also partners with academia and industry and provides support to start-up technology companies and entrepreneurs to help take innovative ideas and processes to market and to foster an economy fueled by 21st century innovation-driven entrepreneurship. Core funding for the Cluster is generously provided by our partners: Ontario Centres of Excellence, Trent University, Fleming College and the Peterborough Region Angel Network. Follow us on Twitter: @InnovationPtbo; on Facebook: www.facebook.com/InnovationCluster; and via our LinkedIn Group: Greater Peterborough Innovation Cluster. You're Invited to: First Quarterly Breakfast of 2014 on February 14th! More than just “spam” – Canada’s new anti-spam laws and your business. This event will highlight Canada’s new anti-spam laws that will come into effect on July 1, 2014. Canada’s new anti-spam laws will come into force on July 1, 2014: and it’s time for businesses to prepare! Though aimed at those unwanted e-mails we get offering cheap prescription medications, this law will also have a far reaching impact on how businesses of all sizes communicate with their customers and potential customers. In reality, “spam” is something of a misnomer, since the law goes beyond unsolicited e-mail by extending to all commercial electronic messages. The law casts a wide net by impacting most businesses that send electronic communications, such as e-mails. This presentation by Bereskin & Parr is designed to provide a rundown of Canada’s new anti-spam laws. Attend to learn how to get your company compliant now! Please Register by February 10th by clicking here!